Craig A. Smith was born in the early 1960’s in the state of Iowa. The Boeing company beckoned, and the entire family of 6 soon settled in the Puget Sound region, where two more children were born. Craig and his siblings all attended various public schools in the Seattle and Shoreline districts over the years, and he graduated from Shorewood High in the late 1970’s. He majored in Animal Science from Washington State University (WSU) in Pullman, Washington, worked in various biotechnology laboratories on campus, and was admitted to the WSU College of Veterinary Medicine in the middle of the 1980’s. 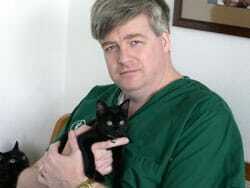 He graduated as a Doctor of Veterinary Medicine exactly ten years after he graduated from High School. Dr. Smith’s professional career began among the horses, goats, and cattle of southern Pierce County and lasted long enough for his wife and him to establish a home near Spanaway. When the housing developments finally eliminated enough open land, he obtained a position as an associate veterinarian at The Pet Doctor in Lakewood. This became a defining moment for him, as he recognized a compelling interest he had never before experienced in all his associations with various animal species: cats are amazing and exciting patients. Within three years, Dr. Smith was committed to focusing his career on providing veterinary care exclusively for cats, and opened Tacoma Cat Hospital in the fall of 1993. Craig and his family still reside near Spanaway, and he divides his time between the Cat Hospital, raising his two sons, his church, and The Boy Scouts of America. 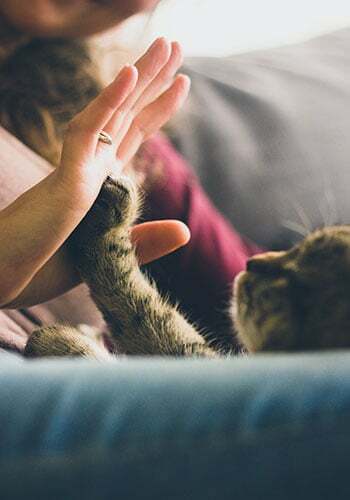 His fervent desire as a Cat Doctor is to help people enjoy fulfilling relationships with their feline pets and provide a source for honest and compassionate advice on how to best care for them. 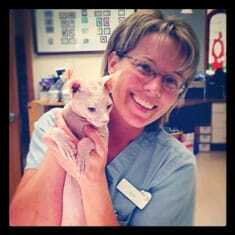 Jen graduated from the Veterinary Technology program at Pierce College in 1991. After graduation she worked at the Pet Doctor for a 2 1/2 years. Having always been very interested in cats, and working in a cats only hospital, she agreed to come with Dr. Smith when he opened the Tacoma Cat Hospital in 1993. She’s been here ever since! Jen loves working in s cats only environment, as she enjoys cats, their unique personalities and helping their owners take care of their cats. Jen and her family enjoy riding quads on the Oregon coast sand dunes. They go as often as possible. If she’s ever not at work, you can bet that’s where she is! She also raises and shows bantam chickens and call ducks. She shares her home with dogs and cats and the yard with various feathered friends and a beehive or two. Elizabeth is a 1985 graduate of the Animal Science department of Washington State University, and earned her veterinary technician license in 1989. She has been employed in the animal care field since her college graduation in a variety of public and private institutions. Her husband and two children care for 3 cats, 1 rat, and a gecko. Kristen is a graduate of the Pierce College Veterinary Technology program class of 2016. She spent her childhood growing up near Woodinville with cats, and developed a passion for caring for them through her years volunteering in the clinic in her local animal shelter. During her free time, she enjoys staying active and playing the piano. 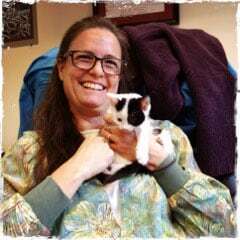 Laura worked as a receptionist for 12 years at The Pet Doctor and another 12 years for Sherwin-Williams Co. before returning to the veterinary field at Tacoma Cat Hospital in January 2013. She is extremely happy to be back in the animal world! Missy is a native Washingtonian who grew up in the Lacey area. Her main responsibility at at Tacoma Cat Hospital is taking care of our boarding cats. 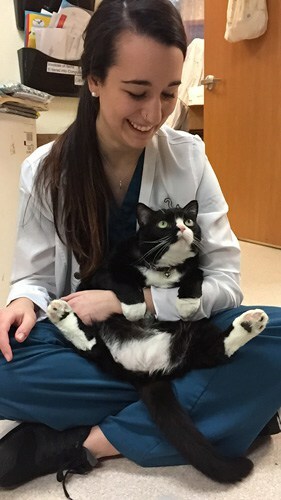 Her favorite parts of the job include getting to know the cats and their owners and also working as a team with an extraordinary crew of caring, compassionate and knowledgeable staff. When not spending time with the kitties in Boarding, Missy enjoys being with her family, listening to music, reading, and hanging out with friends. She lives in Lakewood with her husband, three children, and three fur babies. Nicole is the mother of 2 boys and has been married for 12 years. She is a native of Fircrest, and her family has 3 wonderful cats and 1 perfect dog. 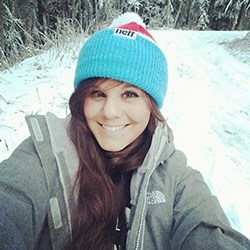 When she is not playing and helping cats at the Cat Hospital, she can usually be found in the mountains with her snowboard or camping with her children. Lisa Roth is originally from Southern California. She knew from an early age that she wanted to become a veterinarian and began working in clinics when she was 15. Her best friend moved to Washington during high school and Lisa fell in love with the state while visiting her. This led to 7 years at Washington State University where she graduated from veterinary school with Dr. Craig Smith in 1989. After graduation, she moved to the west side of the state and has been in continuous practice since. Dr. Roth practices part time at several clinics, enjoying the variety of canine and feline patients along with their owners each offers. 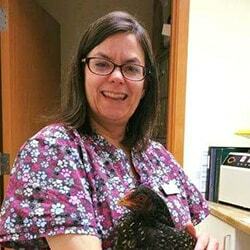 Dr. Roth is owned by 3 cats, 2 standard poodles and a flock of chickens. Her husband, Dan, is recently retired and is now head farm caretaker.